Ubud and Tanah Lot Temple Bali Sunset Tour is a private full day trip to visit the attractions in Ubud and also to experience the gorgeous view of Tanah Lot (Bali sea temple) with a beautiful sunset background. 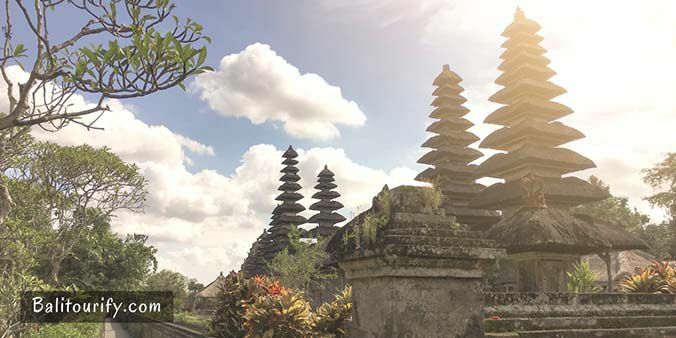 This full day tour is one of the best Bali tours with a combination of the Ubud One Day Tour and Tanah Lot Sunset Tour with an itinerary exploring some best places in Ubud with the last destination to visit Tanah Lot. Ubud is a village and belonging to the Gianyar Regency's territory in Bali, Indonesia, it is located among rice paddies and mere ravines predominantly foothills of the Gianyar regency. Ubud is widely seen as Bali's preeminent arts &culture elements as well as the ideal travel destination on the island of Bali. Tanah Lot Temple is one of the popular sea temples in Bali, it's situated on the southwestern coastline of Bali island with a certain distance of 20 kilometers or around 1-hour drive from Denpasar Town. Seeing the sunset in Tanah Lot is one of the main reasons why many tourists visiting this place every single day. Tanah Lot is one of the best spots to watch the beautiful sunsets in Bali island. 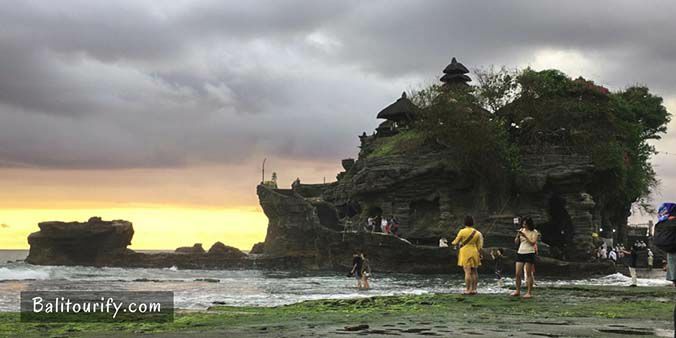 Below is the itinerary of the full day Ubud & Tanah Lot Temple Bali Sunset Tour (10 hours - 11 hours) from Balitourify, the itinerary is flexible and modifiable. Our Balinese driver will be ready to take and drive you to the locations around Ubud and Tanah Lot. 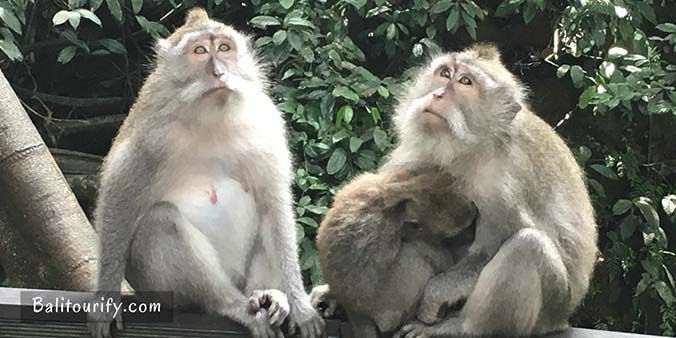 The first attraction to visit in the full day Ubud - Tanah Lot Temple Bali Sunset Tour itinerary is Ubud Monkey Forest (Sacred Monkey Forest Sanctuary). Ubud Monkey Forest is located within the village of Padangtegal, Ubud, Gianyar, Bali, more or less 23 kilometers (1 hour drive) from Denpasar City. There are numerous of interesting spots that you might discover at this site. Besides around 700 monkeys living here, additionally you will see a temple and the 186 different types of trees in 12.5 hectares of forest in which may offering you to get a rich of breeze. The second place to visit in the full day Ubud & Tanah Lot Temple Bali Sunset Tour program is The Tegalalang Rice Terrace or well known as Ceking Rice Terraces. 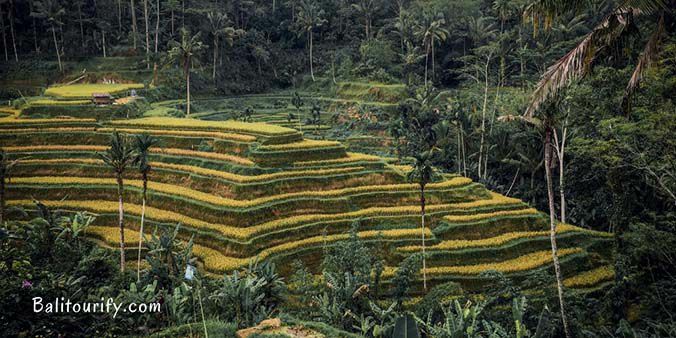 Tegalalang rice terrace is located approximately 11 kilometers or around 25 minutes drive from the town of Ubud. The terraced rice fields are located in the village of Tegalalang. The village sits on somewhere around 600 above sea levels coated by the excellent range of temperatures that is definitely where the majority of the local villagers as the farmer and landowner. Tegalalang rice terrace offers a charming outlook of the rice paddies on the slopes of the hills across the valley. The following location to visit in the full day Ubud Tanah Lot Temple Bali Sunset Tour is the site where you are able to try a wide selection of herbal teas or coffees, it is found in Tegalalang's main road. Here you can actually taste them for free of charge such as ginseng coffee, ginger tea, coconut coffee, mangosteen tea, saffron tea, vanilla coffee, etc. 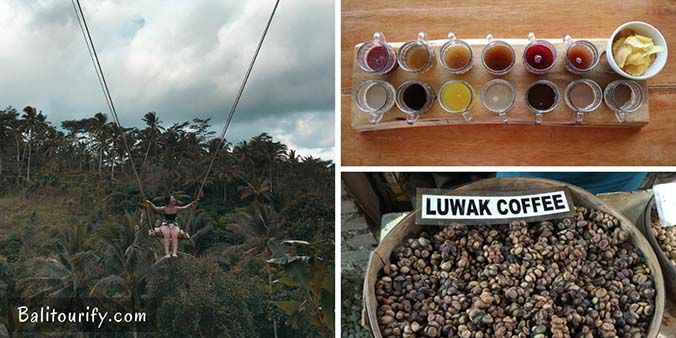 Do you know about "Luwak Coffee"? it is possibly one of the world's greatest coffees. Luwak Coffee or Civet Coffee (Indonesian: Kopi Luwak), which implies the coffee that made from partially digested coffee beans, eaten and defecated by the Asian palm civets. The palm civet of Asia (Paradoxurus hermaphroditus) is the small viverrid that has native habitats in South Asia as well as in Southeast Asia. But if you're interested to try Luwak Coffee then the cost is IDR 50,000 (3,5 USD) per cup. Furthermore, on this spot, you could also rent and play a swing which is certainly ideal for those of you who like a new pleasant experience. The next stop will be a local restaurant for lunch, we will take you to a nice and standard place to have lunch with a good local menu (typically Indonesian menu). 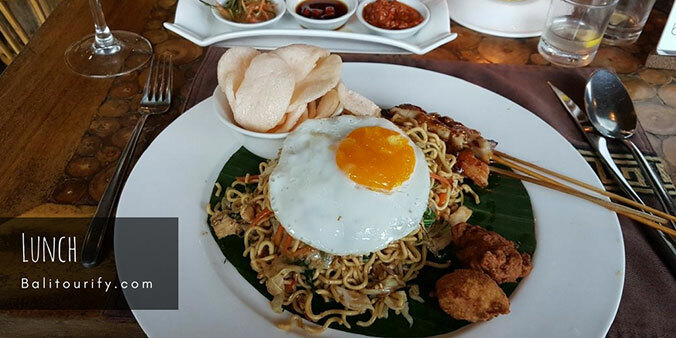 The restaurant is located close to the Ubud town, on the main road to the southwest or to Tanah Lot. You can take a break while enjoying lunch with a great atmosphere and with a cool breeze. Here we will take a break for an hour before we continue to the following destination in the schedule of Ubud and Tanah Lot Temple Bali Sunset Tour. The next destination to explore in the one day Ubud & Tanah Lot Temple Bali Sunset Tour program is Taman Ayun Temple that is located in Mengwi Sub-District, Badung Regency, Bali, around 17 km (35 minutes drive from Ubud). Taman Ayun is a temple used by the kingdom of Mengwi to adorate the ancestral spirits of the kings. Taman Ayun Temple is the remarkable water temple with its valuable architectural design and style, exemplifies the massive development of the Subak irrigation system under imperial authorities of Bali in the 19th century. Taman Ayun Temple encircled by the large water ponds also provides a beautiful garden around it. The temple of Taman Ayun was constructed in the 17th century exactly in 1632 and done in 1634 by the King of Mengwi named I Gusti Agung Putu, assisted by a Chinese architect called Ing Khang Ghoew commonly called I Kaco. Taman Ayun Temple has been selected in 2012 as one of the specific sites in Bali island which have turned into the location of world cultural heritage (the cultural landscape of Bali province). This is the final place to explore in the whole day Ubud and Tanah Lot Temple Bali Sunset Tour program. Tanah Lot is located in the coastline in Beraban Village, Kediri Sub-district, Tabanan Regency, Bali, around 32 kilometers (about 1 hour drive from Ubud Town). Tanah Lot Temple (Indonesian: Pura Tanah Lot) is a Balinese Hindu temple sits on a big offshore rock pointing the Indian ocean which has been formed constantly throughout the years by the ocean tide. Tanah Lot Temple was built in 16th century by a holy priest from Java known as Dang Hyang Nirartha, Bali island was ruled by King Raja Dalem Waturenggong at that time period. This sea temple was built to worship the God of the sea named Lord Varuna (Dewa Baruna). Tanah Lot is very famous for its beautiful sunset, especially when the sky is clear, this is a wonderful time for those of you who like to take pictures of the beach and sunset. The inclusions and exclusions of The Full Day Ubud & Tanah Lot Temple Bali Sunset Tour. General information of the entrance fees and the opening hours of the attractions on the itinerary of The Full Day Ubud - Tanah Lot Temple Bali Sunset Tour. The Pick-up time and location of The Full Day Ubud & Tanah Lot Temple Bali Sunset Tour. Below are the common things to bring on The Full Day Ubud and Tanah Lot Temple Bali Sunset Tour. We accept cash payment for The Full Day Ubud and Tanah Lot Temple Bali Sunset Tour. You can pay directly to our driver on the same day of the tour. You are free to cancel the booking of The Full Day Ubud - Tanah Lot Temple Bali Sunset Tour. You must inform us in one day before the tour (24 hours earlier) for the cancellation. Below are the common questions about the private full day Ubud & Tanah Lot Temple Bali Sunset Tour. Please contact us if you would like to ask any other questions about this day trip. 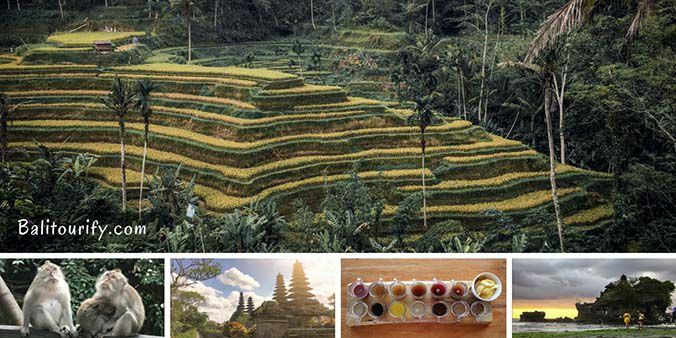 What's included in the full day Ubud and Tanah Lot Temple Tour? What is NOT included in the whole day Ubud & Tanah Lot Sunset Tour? Is the price listed in the one day Ubud - Tanah Lot Tour for per person or per vehicle? The price listed in the full day Ubud - Tanah Lot Tour is per vehicle (NOT per person), our vehicle capacity is maximum 6 persons. If you book the full day Ubud & Tanah Lot Tour for 1 person or maybe 6 persons then the price would be the same (IDR 550,000). How much the entrance fee to visit the Ubud Monkey Forest? The entrance fee of Ubud monkey forest is IDR 50,000 /person (valid for 2018 - 2019, it may change without any notice). May I touch the monkeys in Ubud monkey forest? will they bite? Do not touch the monkey (it's not advised for your own safety), although they are definitely friendly but sometimes they may attack in times when they are disturbed (specifically female monkey with its baby), and please make sure your own personal belongings (handbag, glasses, phone, hat, drinking water, camera, wallet, etc) are safe and secure before entering the forest so as not to be taken away by monkeys. The guards with green uniform are standby around the forest and they are ready to help out for any kind of assistance. The entrance fee of Tegalalang Rice Terrace is IDR 10,000 /person (valid for 2018 - 2019, it may change without any notice). The entrance fee of Taman Ayun Temple is IDR 20,000 /person and half price for the children (valid for 2018 - 2019, it may change without any notice). The entrance fee of Tanah Lot Bali is IDR 60,000 /person and half price for the children (valid for 2018 - 2019, it may change without any notice). What is the best time to watch the sunset in Tanah Lot? How do I book for the full day Ubud and Tanah Lot Temple Bali Sunset Tour? You can easily fill your details in the Book Now tab below to book the one day Ubud & Tanah Lot Temple Bali Sunset Tour. You can also send us an email or at this page to book this tour, all tours that are available on our website have the ID, make sure to mention the ID when you book a day trip from us (The ID for Ubud & Tanah Lot Tour is UTT-01). How do I pay for the full day Ubud and Tanah Lot Tour? We accept cash at the moment, you can pay directly to our driver who comes along with you on this Ubud - Tanah Lot Tour. How do I cancel the booking of this Full Day Ubud and Tanah Lot Temple Bali Sunset Tour? You are free to cancel the booking of this Full Day Ubud and Tanah Lot Temple Bali Sunset Tour with no cost, but you must notify us about the cancellation at least one day in advance by sending us an email or calling to our contact number.